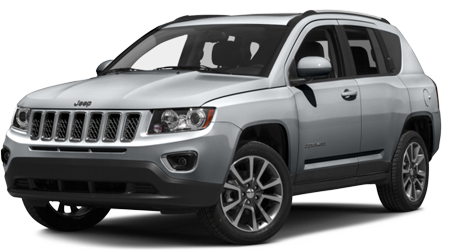 The 2016 Jeep Compass is a compact SUV that comes with all the great features and powertrain typically associated with the automaker, but in a small package that packs a solid punch. If you are searching for a stylish, yet affordable crossover with off-road capabilities, the 2016 Compass is the vehicle to see. Located in Sulphur Springs, TX Sulphur Springs CDJR carries an enormous inventory of all things Jeep and our salespeople take pride in offering one of the best customer service experiences in the area. When you are ready to explore the Compass and grab of all the adventure waiting inside the SUV, visit us if you are near the Tyler, and Greenville. Our team looks forward to meeting your car-buying needs. The 2016 Jeep Compass received an interior upgrade two models ago, and the newest version continues to take that style and grow on it. With ample front and back passenger space, a sleek interior, a large and easy to use dashboard, the interior manages to score huge points in luxury and usability. The Jeep's 8.4-inch touchscreen infotainment system uses the Uconnect interface (in the upgraded trims) to create one of the more advanced technological cabins on the market and incorporates smartphone, Bluetooth® and hands-free technology with ease. Cargo-wise, the Compass offers a solid 53.6 cubic feet of space, which is just enough to pack for one of those unexpected weekend adventures. Overall, the Jeep's interior adds to the value of the car and provides a polished and well-designed experience. When you are ready to experience a compact SUV with all the style and design ingenuity that only the automakers at Jeep can offer, visit us at Sulphur Springs CDJR to discover the 2016 Compass first hand. With excellent on and off-road performance specification, a sleek and distinctively Jeep exterior, nothing is lacking in this affordable and wonderful SUV. Our dealership is located at 1505 Industrial Drive West, Sulphur Springs, TX 75482 and serves patrons near the Tyler, and Greenville with a team of knowledgeable sales people ready meet your every need.